Experiencing the 90's in all of its glory was a turning point for me. Rock N Roll had never been so great with bands making their way to the forefront like Sunny Day Real Estate, The Afghan Whigs, Fugazi, Nirvana, The Deftones, Shiner, and the list can fill up every page on this site. I remember stuffing cash into an envelope and sending it to some of my favorite bands' addresses and within 2 to 4 weeks, I'd get a shirt in the mail! After opening the package, I would immediately feel the print and it was a mystery to me of how that print got on a shirt. Fast forward through being in bands, touring, working different jobs, college, more working....I decided that I wanted to be the guy printing the shirts for some of my favorite bands, friends, and businesses. Having no clue where to begin, I just started reading everything I could about screen printing and was finally ready to figure out how to make it happen. I decided to start a screen printing company....during the recession....while being $380 overdrawn in my bank account. Not being able to afford equipment, I built what I needed to get the job done - screen printing shirts and posters on the floor, using a homemade exposure unit, washing screens out using the shower, and curing shirts on a baking sheet in my oven of a small studio apartment (don't worry, I was able to do wash tests to make sure I had the timing just right). Then eventually moved into a small house using its entirety as a print shop. And onto a 600 square foot garage! I thought this was it, I made it! I had a little 6 color manual press, a dryer, a garage.....there's nothing more I need. Jobs kept rolling in and boxes of shirts were flowing out of the shop into the driveway. 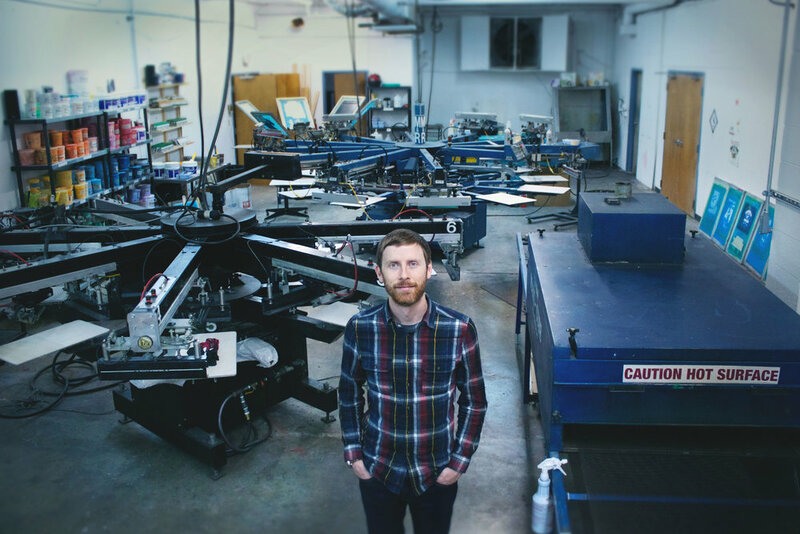 Now we find ourselves here in an almost 4,000 square foot space with our dear 6 color manual press and dryer, fully automated with two automatic presses and able to print around 1,000+ shirts an hour. And with the launch of MerchCave in 2015, we offer worldwide fulfillment under one roof, which makes for a more seamless transition from production to pick, pack, and ship solutions. I have put together a team of great, hard working people who take pride in their work and are just as excited about providing the world with only the best merch! All of that to say.....I am completely obsessed with a good shirt.